From a very young age, it was drilled into my head that I would go to college. While I knew that college was the next step on my journey after high school, I had no clue what I wanted to do with my life, or what I wanted to major in. So, I enrolled as an undeclared major. I took classes in psychology, sociology, anthropology, Spanish, social work, and humanities trying to figure out what I wanted to do professionally. Finally, after attending school for SEVEN years, I graduated with a Bachelor of Arts Degree in Cultural Anthropology with a minor in Sociology. However, when I graduated, I was left wondering, what should I do for a career?! With some intense soul searching, I decided to go back to school and get my Nursing Degree. While I enjoyed my college experiences and the classes I took, I didn't need a college degree to become an online business owner. In fact, I’m not using any of what I learned in college to make money today. If you're looking to break into a home-based career or start your own business, you don't need to spend thousands and go back to college. Instead, try out Skillshare. Creating Your Own College-Like Education. Skillshare is an online learning community that hosts over 17,000 online classes in a variety of topics. Think you want to start a graphic design business from home? They got you covered. Or is social media and blogging more your thing? With Skillshare you can create a custom curriculum based specifically on your needs and passions, and best of all, it's budget-friendly – only $15 a month for as many courses as you want to consume! But right now, for a limited time, Skillshare is giving readers of The Work at Home Woman two FREE months of their premium membership service! Just click HERE to start your two free months. Skillshare Has Classes in Everything! Whether you’re looking to hone your current trade or jump into something new, Skillshare has a wide variety of categories to fulfill your needs. Creative: Animation, film production, fine art, graphic design, illustration, music production, photography, UI/UX design, and writing. Technology: Data science, game design, IT security, mobile development, product management, and web development. Business: Accounting, business analytics, freelance, human resources, leadership, management, marketing, productivity, and sales. Lifestyle: Crafts, culinary, gaming, health, wellness, home business, languages, and teaching. The Caliber of Classes and Instructors. Now, you may be asking what’s the quality of these courses since access to the entire catalog is only $15 a month? Many of these classes are taught by world-class experts and best-selling authors, like Rand Fishkin, Gary Vaynerchuk, Seth Godin, and Peg Fitzpatrick. You can also view how many people have taken each course and what others have rated it. Courses are in video format and are delivered in bite-sized chunks. This Instagram class I took, contained 20 videos that ran over 40 minutes total. Besides the videos, there's a community section on each course where you can connect with other students and the instructor, as well as a place to upload your projects. You can also view courses on your desktop or mobile devices, so you can take your learning wherever you go. I've been personally playing around with the platform for a few weeks now, and I have eight saved classes that I'm eager to check out. But honestly, I haven't even scratched the surface of what Skillshare has to offer. Here's a Sampling of Skillshare's Classes. Level-up Your Work-at-Home Career with Two FREE Months of Classes From Skillshare. Usually, Skillshare is $15 per month, but right now, Skillshare is offering our readers two FREE months of their premium membership service! All you have to do is click HERE to grab your two free months. After that, you can invite your friends to try Skillshare out for a FREE two-month trial, and you'll earn one free month for each friend who signs up. I wish I had known about Skillshare last month when I purchased two online social media courses (not even in video format) for $69. Had I came across Skillshare first, I could have taken two very similar courses for just $15 and saved myself $54 bucks! 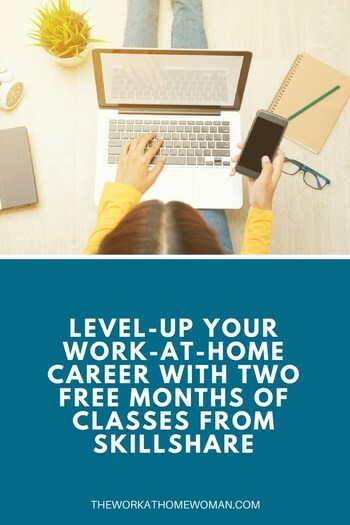 If you're ready to give your at-home career or business the boost it needs, be sure to sign up for this free trial offer HERE! This post was sponsored by Skillshare. Please be aware we only promote advertising from companies that we feel we can legitimately recommend to our readers. See our disclosure policy for further information. Thank You so much for the Skillshare Promotion, I will be signing up. You have great information here and I am thankful to have all your great information and links to find my niche! I’m heading over to Skillshare now to sign up. Thanks for sharing this promo and your personal experience with Skillshare. The way technology changes day to day it definitely helps to be as informed as possible about all the new methods. I’m excited to see what Skillshare has to offer. That’s great, Megan! They have a TON of great courses! Let me know how it works out for you. Thanks for sharing the free two months promo for Skillshare. I just signed up and can’t wait to take my first class. I was excited by all of the classes they have listed and am now trying to figure out which ones to take first. So many choices! I love your blog and having been following you for 2 years. You are my favorite Work at Home blogger. I enjoy your articles and have found so many helpful tips and ideas reading through them. Awww, thanks for your kind words! I’m so glad you’re finding the information useful. I know what you mean, Skillshare has so many courses; it’s hard to choose. I have a bunch saved under “My Classes.” Now, I just need to find the time to watch them all. Best of luck on your WAH journey! You know I’m passing this along. Hope you’re having a great week so far! Hey Cori, You’re welcome. They have an amazing platform! So many courses, so little time! Thanks for spreading the word!